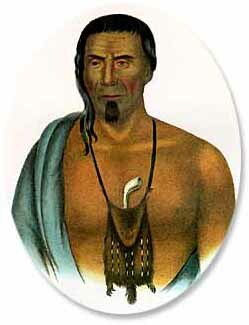 Portrait of Tish-Co-Han, a chief of the Delaware tribe. The chief's name means "He who never blackens himself." He was known for signing the "Walking Purchase of 1737," a treaty which ceded much American Indian land in the Pennsylvania area to white settlers. The Delaware natives, also called the Lenape, originally lived along the Delaware River in New Jersey. They speak a form of the Algonquian language and are thus related to the Miami natives, Ottawa natives, and Shawnee natives. The Delawares were called "Grandfathers" by the other Algonquian tribes because of their belief that the Delawares were among the oldest groups in the Algonquian nation. As British colonists encroached on Delaware territory on the East Coast, the Delaware were forced Westward. The 1758 Treaty of Easton compelled the Delaware into the Ohio territory. While trying to escape the British colonists, the Delawares encountered the Iroquois natives, who struggled with the Delaware and drove them further west. Some Delaware natives came to live in eastern Ohio along the Muskingum River, while others resided in northwestern Ohio along the Auglaize River. Once in Ohio, the Delaware grew into a powerful tribe that often resisted the further advances of the Iroquois. Upon arriving in the Ohio Country, the Delawares formed alliances with Frenchmen engaged in the fur trade. The French provided the natives with European cookware and guns, as well as alcohol, in return for furs. This alliance would prove to be temporary at best, as French and British colonists struggled for control of the Ohio Country beginning in the 1740s. As one European power gained control of the area the Delawares chose to ally themselves with the stronger party. This was the case until the Treaty of Paris (1763) ended the French and Indian War. As a result of this war, the French abandoned all of their North American colonies to Britain. The Delawares thereafter remained loyal to the British and the American colonists until the American Revolution. During the Revolution, the Delaware became a divided people. Many attempted to remain neutral in the conflict, especially those who had adopted Christianity and lived in Moravian Church missions at Schoenbrunn and Gnadenhutten in what is now eastern Ohio. Other Delaware supported the British, who had replaced the French traders at the end of the French and Indian War. These natives thanked Britain for the Proclamation of 1763, which prohibited colonists from settling any further west than the Appalachian Mountains. They feared that if the Americans were victorious, the Delaware would be driven from their lands. Despite the Delawares' fears, many Americans hoped that they could count on the tribe as allies. As the war progressed, however, not all Americans trusted them. In 1782, a group of Pennsylvania militiamen, falsely believing the natives were responsible for several raids, killed almost one hundred Christian Delaware in what became known as the Gnadenhutten Massacre. Although these Delaware were friendly to the Americans, they suffered due to the fears of some of their white neighbors. Following the American victory in the Revolution, the Delaware struggled against whites as they moved onto the natives' territory. In 1794, General Anthony Wayne defeated the Delawares and other Ohio natives at the Battle of Fallen Timbers. The natives were forced to surrender most of their Ohio lands with the signing of the Treaty of Greeneville in 1795. In 1829, the United States forced the Delawares to relinquish their remaining land in Ohio and move west of the Mississippi River.